Furkids is home to some of the most amazing and incredibly dedicated and generous individuals. 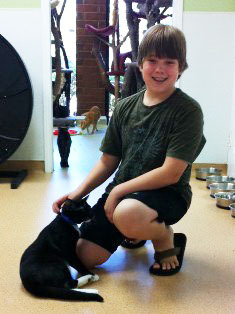 As you will see in these profiles, they give countless hours of support and love to our animals. We would not be where we are today if it were not for them. It gives us great joy to share with you insights from our wonderful friends. 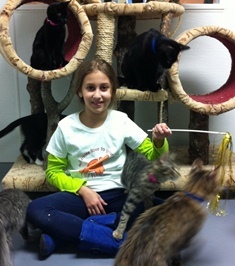 How long have you been a volunteer at Furkids? I’ve been coming in since early 2012 and having a blast. How many hours per week do you volunteer? I do a few hours in the morning, usually three days a week. Where/how do you primarily volunteer? 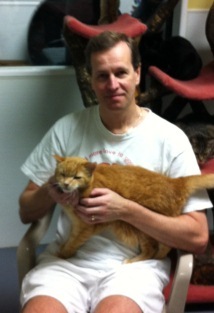 I do most of my service at the shelter with Thursdays at the FIV house (a/k/a the Cat House). I’d say it’s around 80% cleaning and 20% socialization with the cats (or cat lovin as I like to say). I enjoy being around people who care as much about animals as I do. However the ultimate joy is working with the cats. Since these are the ones that nobody wanted or cared about, I enjoy making them feel special. Based on the purrs and nuzzling, I’d say they appreciate it. Which cat/dog is your favorite? Why? Of course I love each and every one of them but two cats have really touched my heart, Hadrian & Michael. They are my shelter snowflakes—very delicate, very fragile and very special. 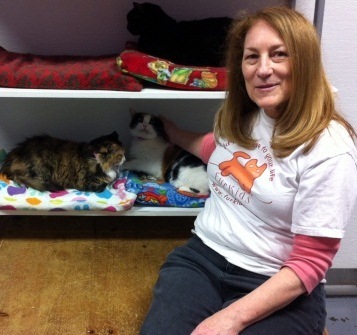 I start & end my time at the shelter with a visit to their room to give them some extra cat lovin. What would you like visitors to our website to know most about Furkids? The people at the shelter and cat house are real-life super heroes. They work tirelessly with unparalleled devotion to make sure all of the cats get the best care, love and attention. I’m proud to volunteer beside them. They’re a great bunch. What do you do when you are not volunteering for Furkids? I do house work, yard work, fix-it projects around the house. I’m pretty much a house husband these days. During the fall, you’ll find us down at Auburn for the football games. We have a four year old tuxedo cat named Crossfire. We found her as a kitten while walking in the neighborhood one evening. As we like to say, she adopted us. Name one thing you have, one thing you do, and one thing you like. I do: have a passion for Auburn football and anything sci-fi. I like: a strong ale in a frosty glass. An average of 4-6 hours per week. 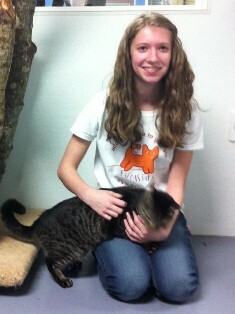 Most of my volunteer hours are at the main shelter. Knowing I’m helping lost, abandoned or mistreated cats learn to trust people and live a happy life. I have so many favorites – Hadrian, Harry Truman, Foxy & Roxy, Mixie and many others. I think everyone should know what a terrific job Furkids does in helping their animals find loving homes. I’m keeping busy starting a home based bookkeeping business. I have two cats. Suki is a 16 year old female dilute tortoiseshell and Junior is a 10 year old yellow tabby. Suki was a stray who had somehow become separated from her family when she was about two years old. Junior was an 8 week old kitten, adopted to give Suki some feline company. I have: several very good friends. I do: aerobics classes every week. I like: (love) hearing cats purr. When we come, we stay for about 3 hours. We try to come twice a month. I socialize with all the cats while my mom cleans one of the rooms. I love how cats have different personalities. Some just like to sit on your lap, while others you have to work with to get them out of their shells. Cats are like chocolate! Some are your favorite, but you enjoy them all. I really like Libby and Blue, And there’s a calico in room 1-2-3 that just sits and watches you with loving eyes. I like Libby because she’s super-friendly. I like Blue because she’s like me — kind of shy, but grateful when she gets to know you. They have the best shelter I have seen. Schoolwork, video games, or petting Apollo. He’s our new cat that we adopted from Furkids. Hunter is our seven-year-old Golden Retriever, and Apollo our new cat that is fitting in well. He’s a tuxedo cat and about one year old. I like: pets and video games. I socialize with the kitties at the main shelter. I like all the ones that like me. You can adopt just about any kind of cat you can think of. Yes — a very energetic dog, a sweet hamster, and a cranky extremely old cat. I have: a large love for animals. I like: BEEF! (see YouTube video “I Like Beef,” starring cats!). I volunteer for about 2 hours every week. I usually clean Room 8 and then socialize with the kittens. I love being around the cats and getting to know them better. After high school I hope to study a major in college where i can get to work with animals, just like all the wonderful kitties at Furkids. Hammer from room 8 is my favorite, because he is a big sweetie! He always wants attention and loves to play. That every cat at Furkids has his or her own wonderful, unique personality and deserves a forever home. I am usually studying or attending some of the clubs I participate in at my high school. Right now I have a cockatiel named Nicki. I would love to adopt a cat for Furkids, but unfortunately my dad isn’t too fond of cats. I have: a passion for helping animals. I do: art! My favorite class at school. I like: joking around with my sisters. I have been with Furkids for 5 years. I average 4-6 hours per week. I primarily volunteer at the Shelter as a Front Ambassador but also help out at the Petsmart Perimeter twice a month. I also help as much as I can with events. What I like most about volunteering, besides being around all the great animals, is seeing the compassion and kindness of all these amazing people that take car of them. My favorite animals, besides my 2 boys who came from Furkids, is Simon, who likes to give hugs!! I would love everyone to know that Furkids is the best shelter that always has the animals best interests at heart! Yes, my 2 boys are PeeWee and Jojo – adopted from Furkids 4 years ago. My home is now their domain – I’m just there to feed and love on them!! I do: live my life with Jesus in my heart. I like: to feel that I help someone or something everyday!